REFRAVER S is a silicone treated glass cement composite and is available as machined parts. It is non combustible and can operate at temperatures up to 500°C. REFRAVER has excellent resistance to electrical and thermal shocks. If ARCLEX and SINDANYO are world class materials developed in the UK, REFRAVER S can claim to be a world leading electrical insulation material developed in France for the demanding SNCF French TGV train operation. REFRAVER S is specified by some of the World’s most prestigious companies, e.g. the French railways SNCF, the Belgian railways, the underground systems in Paris, Milan, and Chile, where it is approved under the arduous ST273 Cat 2 test protocol. Major switchgear manufacturers use REFRAVER S for the most arduous applications. Russian Railways have approved REFRAVER S for use in their high performance switches via a major European Switch manufacturer. REFRAVER S is used as transport and power switchgear arc boxes, circuit breakers, snuffer boxes and electrical containment in general. REFRAVER S is used in the aluminium smelting industry where thermal and electrical insulation is required. An example of this type of application would be crust breaker insulators which prevents shorting in the electrolysis pot. REFRAVER S is a silicone treated glass cement composite and is available as machined parts. It is non combustible and can operate at temperatures up to 500°C. REFRAVER has excellent resistance to electrical and thermal shocks. If ARCLEX and SINDANYO are world class materials developed in the UK, REFRAVER S can claim to be a world leading electrical insulation material developed in France for the demanding SNCF French TGV train operation. 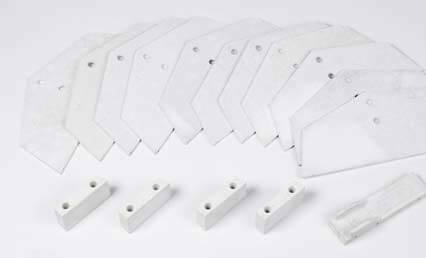 REFRAVER S is available as sheets, sheet cut-offs, tubes and finished machined parts.